With only a 401k and Roth IRA and no taxable account, just put your bonds in the 401k if a good fund is available, and put the U.S. and international equities in the remaining 401k space and Roth IRA. It depends on the exact funds offered in your 401k, but in general place the bond allocation in the 401k if a decent bond fund (diversified with low or moderate expense ratio) is offered in your 401k. Below are the funds for my 401k. Highlighted are the important ones like Bonds, International, and US. What do you think of them? Are the Bond Index in the 401k good enough compared to VTBLX? What about the International Index Fund in the 401k compared to VTIAX? How would you guys recommend my allocations with this given information if I’m looking for a 70/20/10 split across both accounts? I think all of those are excellent three fund portfolio components. The bond fund is fine and comparable to Total Bond. Same with the international to Total International. The large cap index fund is a 500 index, not total market. In my opinion this makes little difference. However, if you want to replicate the total U.S. market, use 80% large cap index and 20% small cap index and you'll be close enough. Or, use your IRA for U.S. equities and use Total Stock Market there, and international in the 401k along with the bonds. Any combination is fine in my opinion. Just use the 401k for bonds and fill out the rest any way you'd like. You have many excellent funds offered in your 401k plan. You are fortunate. The funds you highlighted are the correct funds to use for a three-fund portfolio. 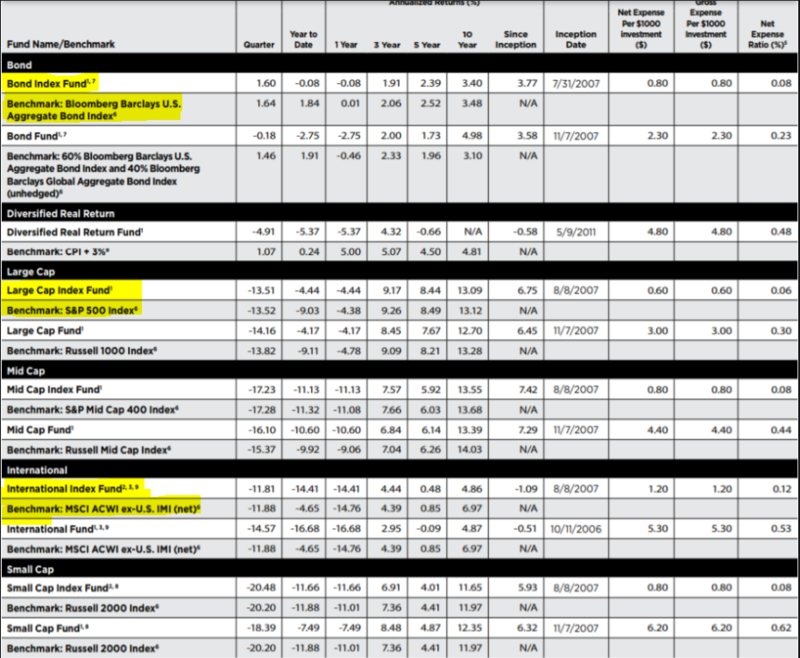 Put all of the bond allocation in your 401k using the Bond Index Fund (Bloomberg Barclays U.S. Aggregate Bond Index) ER 0.08%. That will be almost identical to Vanguard Total Bond Market Index Fund. "In a 401(k) plan with limited choices one might very well opt for an S&P 500 index fund to serve as the domestic stock component of a three-fund portfolio." Wiki article, Three-fund portfolio, "Other considerations". In my opinion in a plan that lacks a total stock market index fund, a S&P 500 index fund (like the Large Cap Index Fund in your 401k plan) is good enough by itself for a domestic stock allocation. A S&P 500 index fund covers 81% of the U.S. stock market, investing in stocks of selected large-cap and mid-cap U.S. companies. In the 27 years since the creation of the first total stock market index fund the performance of the two types of funds has been almost identical. Morningstar, "growth of $10k" graph, VTSAX vs VFIAX. 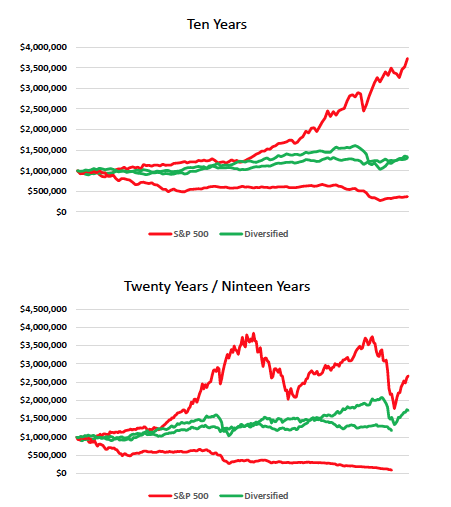 In the first 10 years the S&P 500 fund did better, in the last 10 years the total market fund did better, and over the 27 years the total market fund gave a little more return (0.11% per year), but at the cost of a little more volatility (risk): nisiprius post, in the forum discussion "Exchanging the S&P 500 for the TSM". So it seems that adding a little in mid/small cap stocks trying to mimic the holdings of a total stock market fund has historically made little difference in performance. 2)	Wall Street Physician (01/17/2019), "Should You Invest in the S&P 500 or the Total Stock Market?". If you want to add the Small Cap Index Fund, then an 83/17 mix of S&P 500rRuseell 2000 funds will approximate the content of a total stock market index fund. Wiki article, "Approximating total stock market". In my opinion it is not necessary to add the small-cap fund, it is optional if you prefer to do this. The International Index Fund (MSCI ACWI Ex-U.S. IMI) ER 0.12% is a total international stock index fund, very similar to Vanguard Total International Stock Index Fund. Good post. The Wall Street Physician article shows the 15 year annualized return of the S&P500 at 8.14%, vs. 5.66% for the total market. Is that accurate? Seems like a 2.48% annual difference in CAGR is huge for these two funds. It is just the time frame used, being the last 15 years. Overall there is almost no difference in total return. VTSAX and VFIAX ten year CAGR is 16.05% and 15.90%, respectively, but the article (which is a couple months old) shows 13.06% and 10.51%. Why such a large difference? (apologies in advance if this is off topic for this thread - happy to remove if it is). Neat article. What is in the green "Diversified" portfolio? The diversified portfolio mentioned is a hypothetical portfolio evenly weighted between U.S. stocks, U.S. bonds, Developed International stocks, Developed International bonds, real estate, gold and commodities, rebalanced annually. In his email reply he also said he wouldn’t recommend this to his clients (he is an advisor), but used it for purposes of illustrating the point in the article. Thanks! Good to illustrate the dynamic of diversifying. I would like to see one that is 100% U.S. total stock market and 50/50 U.S./International.